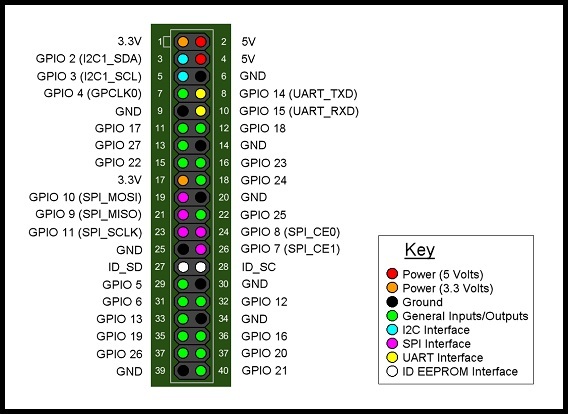 Post subject: How to use all GPIO pinns? I want to use all my GPIO pinns. Is there a way to fix that? Is it easy? Why do i not have free access to all pinns? I hopp that net version of PI for Codesys will open all pinns. Else i Will use the 74HC595 shift register. I only need outputs. Sorry. It was no clear answers in that topic. "c:\Users\<YourWindowsUserName>\CODESYS Control for Raspberry PI\3.5.9.10\Devices\GPIOs.devdesc.xml"
"c:\Users\<YourWindowsUserName>\CODESYS Control for Raspberry PI\3.5.9.10\Libraries\IoDrvGPIO.library"
feel free to customuze the GPIO's to your 3th version and to your demands. 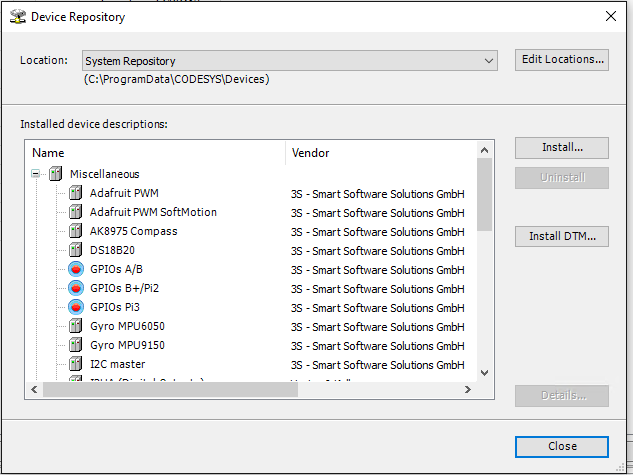 But we don't know what we need to edit in GPIOs.devdesc.xml and oDrvGPIO.library? Why can't they allready been free at the first time? I hopp next update of Raspberry PI for Codesys will have all GPIO's free to use. I am trying to add a new device description for the Pi3. I just copied the one for the Pi2 and changed the name/description/id and put it in the same directory. 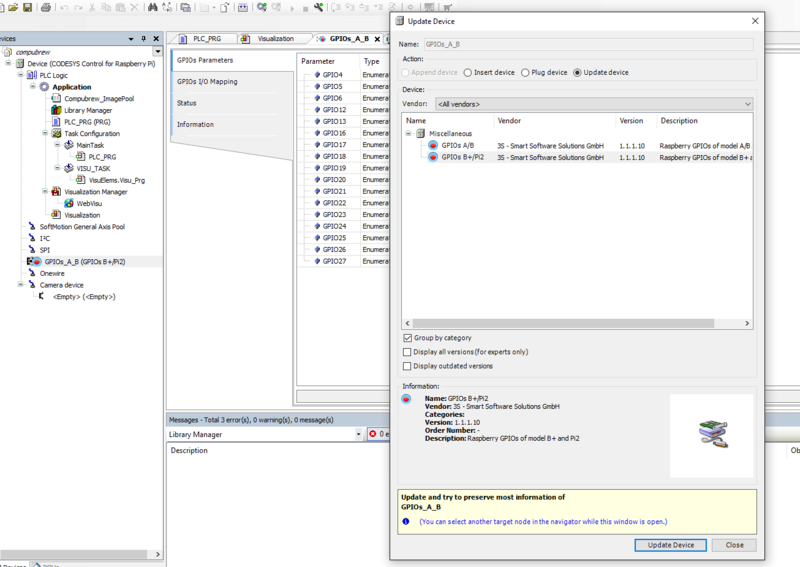 However when I go to install the device into the device repository, my newly created devdesc.xml doesn't show up. Any idea what I am doing wrong? Actually, now I got the new devdesc.xml to show up, and I have added it to the device repository. So I got tired of waiting and just decided to edit the devdes.xml for the B+. 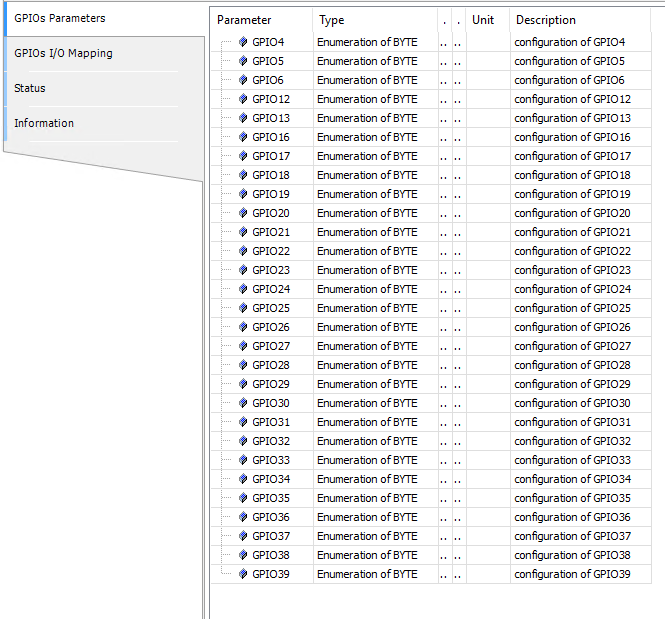 I have now managed to get all of the GPIO pins to show up in the GPIO Parameters Screen which is driven by the devdesc.xml file. It seems a bit strange that you guys haven't included this functionality by default, is there any updates coming that will add the extra Pins? I really need to know this functionality is available before I spend the money on the license. maybe you explain me what you think the difference is between PI2 and PI3 GPIO's. How do you want to solve the Problem that -> SPI and I2C GPIO Pins are already busy for this functionality. This is the reason why we do it that way (we decided this at the beginning on PI A/B release, we thought SPI and I2C are used allways), guess we will not change it due compatibility issues. Users who need all GPIO's need to customize them by their own at the moment. A question do you not/never use SPI and I2C in your application? Maybe there has been some confusion. Let me clarify what I think we are all asking for. On the Pi2 and Pi3 there are 40 pins on the header. On the Pin Mapping page in CodeSys there are only options to map Pins 0-31. I would like to map some pins in the 32-39 range. Also, yes there are some projects where I would like to use the SPI and I2C pins as GPIO, so it would be nice if that was an option as well. Any update, does my previous post explain the issue well? Is this something we can get help with from one of the codesys devs? I am trying to modify this library and it is complicated, probably out of reach for most of the people on this forum. My progress so far consists of changing all the loops from 0-31, to 0-39, but I still only get 0-31 on the gpio mapping screen. Best I can tell is that the library is filtering out some of the pins based on what type they are, but there are close to 30 files in this library and its just tough to tell where the problem is. I have attached my modified devdesc.xml if anyone wants it, but its really no good without the corresponding library. "c:\Users\<YourWindowsUserName>llinger\CODESYS Control for Raspberry PI\3.5.9.x\Libraries\IoDrvGPIO.library"
Work with two instances of CODESYS - one opens the library the other one your testproject to check the GPIOS. Yes I did that already and never could get it to work. I changed every for loop from 31 to 39 in the whole library and never saw any additional pins show up in the GPIO mapping screen. There must be some other part that is I am missing.